Monitor video over the Internet with the airCam security camera, featuring a web-based server/client application that combines camera auto-detection, powerful analytics, sophisticated recording capabilities and advanced management features. The intuitive user interface allows you to track motion-detection events, send alerts and archive unlimited recordings. It also provides complete system performance monitoring to ensure your security system is running smoothly without hiccups. 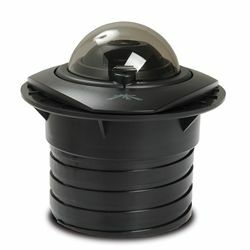 The discreet dome design is easily installed into almost any indoor ceiling or wall. Includes software on CD-ROM and 24V power-over-Ethernet adapter. Requires 1.6GHz PC with Microsoft Windows XP+ or Ubuntu 11.04+.